The ancient idea of “pohopoho” – patching together pieces to save the whole to create a living series of links between protected forests and a surrounding community. This is the driving force behind the five conservation easements that have already been donated on small parcels of land in the Volcano area. 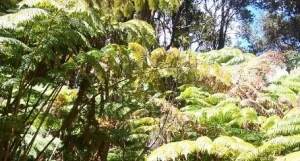 The Kīpuka Mosaic Project is a unique grassroots conservation initiative that is bringing together many small landowners, HILT and other groups to protect small oases (the KĪPUKA) of intact forest canopy in the Volcano community. These Kīpuka will preserve the ability of native birds, insects, and plant seeds to travel and/or propagate along the southern flanks of Mauna Loa. The health of these lands is strongly connected with the quality of life for the local community and brings local people together to protect the land they love. The Kīpuka Mosaic Project will secure up to twenty conservation easements in Hawai‘i’s Puna District, within subdivisions that are located between the Kahauale‘a Natural Area Reserve, Ola‘a Forest Reserve and Hawai‘i Volcanoes National Park. The planned conservation easements will form a stepping stone pattern of intact forest canopy that will facilitate the passage of rare and endangered species between the protected areas, as well a provide critical habitat for rare and endangered endemic plants.